Tessa is the main instructor, and she specialises in dressage. 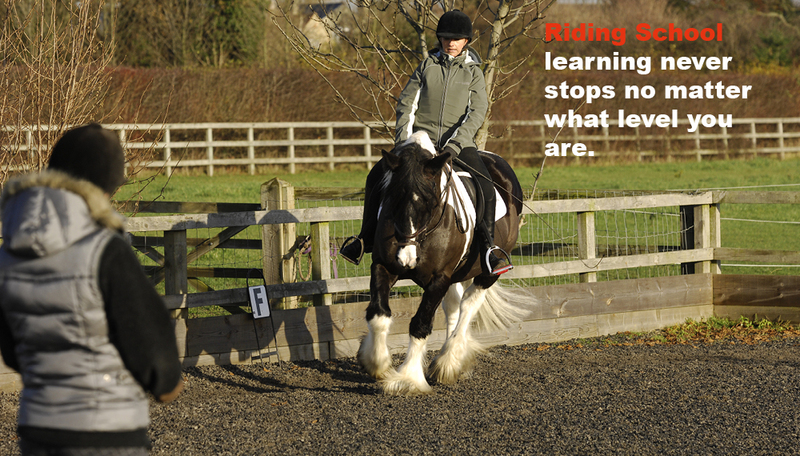 You may have private (individual) lessons or group lessons (which never exceed four riders). Lessons are held in our floodlit 20 x 40 meter all-weather outdoor arena. We also offer hacks around the local countryside. No matter what your level, you will start with an assessment lesson consisting of a 1/2 hour lunging lesson on one of our school masters. This will help us select the most suitable horses for you to ride and identify which group lessons you can join. We are a small riding school with just a handful of horses. This means that we can keep our horses well schooled, which is imperative for you to learn how to ride correctly. Seat and position on a horse is the most important aspect of your riding, hence we focus on this from the outset. When you learn to ride with us, in addition to learning correctly, we also want you to have fun. Accordingly, we keep a relaxed and friendly atmosphere on the yard. We also hold a number of varied and exciting events such as dressage competitions (covering all levels), dressage and jumping clinics, pony days, and even riding trips to Thetford Forest or to the beaches in Norfolk. See our diary of events for details of forthcoming activities. Bronze £150 pcm £34 1hr per lesson approx. We ask for 48 hours’ notice for canceling lessons; otherwise lesson fees are payable in full.